IJITS is an international peer-reviewed journal published in English by Union of Scientists in Bulgaria and printed by TUS-Technology Ltd. 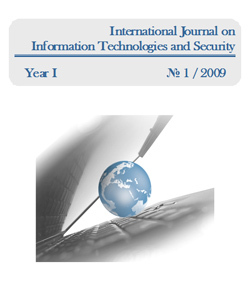 The journal policy is to publish articles that emphasize research, development and applications within the fields of information technologies, information security, security policy and innovation policy. All proposed manuscripts are pre-reviewed by a member of Technical Board and sent for blind peer review. Authors are encouraged to submit high quality, original works (theoretical and application-based studies) that have not been published or accepted for publishing by other journals. Full and extended versions of articles presented during the conferences and symposiums could also be submitted but the paper submitting to the journal should differ from the previously published material by at least 50 percent. Submitted manuscripts must be written in good English. © 2011-2019 ijits-bg.com. All rights reserved.